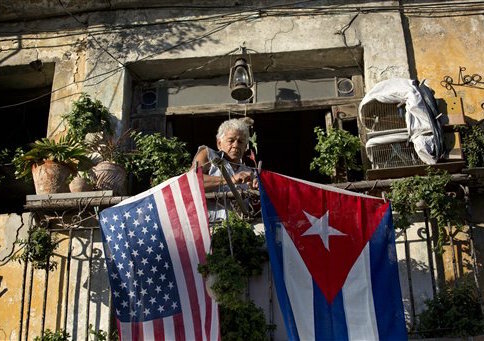 A Cuban dissident waving an American flag in Havana where a U.S. cruise ship docked Monday was arrested as the boat pulled in. Video footage showed Daniel Llorente standing on a pier while the flag draped across his back as locals help up phones and cameras to record the historic voyage. Fox News Latino reported that Llorente was making a speech about liberty when government officials detained him. Despite the U.S. restoring relations with the communist nation last year, the Castro regime still restricts freedom of speech. One woman who confronted Llorente told him he was making a "clown" of himself. "The American flag. What are you doing, for God’s sake?" she said. Llorente replied that he was carrying a "symbol of American pride," adding that he was "not scared of the government." "As Obama said, if you want liberty, it’s the people who will have to make it happen," he said, referring to a speech the president made while visiting Cuba. "I’m here to show Cubans and the world that yes, we can." As the Carnival cruise ship nears, the video shows police manhandling Llorente into a patrol cruiser as he gripped tightly to his American flag. The crowd cheered the arrest as the car pulled away. It is unclear what police charged him with, according to Fox News. Carnival’s voyage Monday restarted commercial sea travel between America and Cuba that had been on pause for nearly 40 years. The cruise liner carried roughly 700 passengers from Miami to Havana. This entry was posted in National Security and tagged Cuba, Raul Castro, Speech. Bookmark the permalink.